King James Bible – King James Only? I have long thought that the proper term for the King James Version is “the Authorized Version.” At times, I’ve wondered if that title isn’t more of a British title, since most Americans prefer “King James Version” or simply the “King James Bible.” But I recently read a historical essay by David Bebbington, professor of History at the University of Stirling, Scotland, in which he points out the fact that the King James Version was not always known as “The Authorized Version.” Bebbington’s essay, “The King James Bible in Britain from the Late Eighteenth Century,” appears in a collection of important historical essays published by Baylor University Press (2011) under the title, The King James Bible and the World It Made (edited by David Lyle Jeffrey). Bebbington argues convincingly that the King James Bible did not enjoy universal acclaim in the eighteenth century until the very end of that period. In a post at my personal blog, I excerpted Bebbington’s conclusion, which argues that “the enthusiasm for the translation of 1611 rose and fell with the growth and decay of Romantic sensibility.” In the excerpt provided below, I would like to quote his description of how the title “the Authorized Version” came to be used for the King James Bible. You can pick up a copy of this book at any of the following online retailers: CBD, Amazon, Barnes & Noble, or Baylor University Press. Disclaimer: This book was provided by Baylor University Press for review. I was under no obligation to offer a favorable review. Was the King James Bible Published on May 2nd, 1611? I have a confession, I depended on Google to verify the publication date of the King James Bible when I posted my recent video review of Dr. Donald Brake’s A Visual History of the King James Bible. I had heard the date May 2, given for the publishing of the KJB from the Haven Today radio interview of Dr. Brake. I Googled and found that several other sites were saying May 2 was “the date”. I came across this blog post, where the blogger directly asked Dr. Brake if May 2nd was the date. Here’s an excerpt from his post and I think this answers the question. To continue our celebration of the 400th Anniversary of the King James Bible, we’re going to offer a giveaway of one copy of the King James Bible 1611 Commemorative Edition from Hendrickson Publishers to one of our readers. The contest details are below. For the bonus question use one of these links (ChristianBook.com or Hendrickson.com), and view a sample chapter. You can also purchase your own copy of the 1611 KJB from those links or from Amazon.com as well. Contest is now closed. Congratulations to Justin Matthews for winning the free KJB 1611 Bible. Today is the 400th Anniversary of the printing of the King James Bible. In honor of that, I tried my hand at my first video book review. 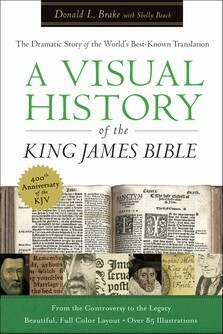 Below, you’ll find a video review of A Visual History of the King James Bible by Donald L. Brake. While there are a few audio glitches, the stunning visual beauty of Brake’s book is put on full display. I hope you’ll consider picking up a copy of this book as a way of celebrating this momentous occasion. A Visual History of the King James Bible — A Video Review from Bob Hayton on Vimeo. The book can be purchased from these retailers: Christianbook.com, Amazon.com or direct from Baker Books. Also, be sure to check out Dr. Brake’s other book: A Visual History of the English Bible (Baker Books, 2008). Disclaimer: This book was provided by Baker Books. I was under no obligation to offer a favorable review. ~cross-posted from my personal blog, FundamentallyReformed.com. At Haven Today, a nationally syndicated Christian radio show and podcast, Dr. Donald Brake was recently interviewed on the 400th Anniversary of the King James Bible. Dr. Brake is the author of A Visual History of the English Bible (Baker Books, 2008) and the recently released A Visual History of the King James Bible (Baker Books, 2011). I just completed reading through this fascinating book and will be putting my review up soon. The 400th anniversary of the King James Bible is next week, May 2nd. Dr. Brake’s interview will be very informative. Here are the links to the interview: Part 1 (April 25, 2011), Part 2 (April 26, 2011). More information is available on the interview at HavenToday.org. These interviews are only about 15 to 20 minutes long minus the commercial breaks (which is just music on the web-player), but they’ll whet your appetite for this book. To see an excerpt of Dr. Brake’s A Visual History of the King James Bible, click here. You can order the book through Amazon.com, Christianbook.com, or direct from Baker Books. ~cross-posted from my personal blog, Fundamentally Reformed. This past weekend, The New York Times published an article by Charles McGrath on the King James Bible’s 400th anniversary. The print copy of the article was entitled, “Thou Shalt Not Be Colloquial.” The online copy which is expanded (I think), is entitled, “Why the King James Bible Endures”. Here is an excerpt. I thought it was interesting how the archaic language adds to the appeal of the KJV today, especially as opposed to the wide array of translations now available. I encourage you to read the entire article. Not everyone prefers a God who talks like a pal or a guidance counselor. Even some of us who are nonbelievers want a God who speaketh like — well, God. The great achievement of the King James translators is to have arrived at a language that is both ordinary and heightened, that rings in the ear and lingers in the mind. And that all 54 of them were able to agree on every phrase, every comma, without sounding as gassy and evasive as the Financial Crisis Inquiry Commission, is little short of amazing, in itself proof of something like divine inspiration.